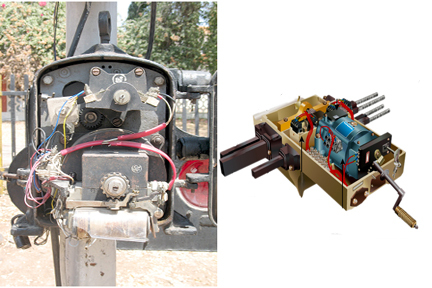 Motor Operated Point layouts – with Siemens , IRS rotary Type (LH , RH types), clamp type point machine(GKP make). Juncyion type route indicator with LED units. Multi lamp and stencil type route indicators. Cascaded 3 and 4 aspect signals, Shunt signal unit. LC gates- Electrical lifting barriers (Podanur, Heitz makes ). Electrical & Solar Signal machines for semaphore signals (LQ & UQ) . Universal , UQ and LQ Signal mechanisms, wire operated point mechanisms, Double wrie levers assembly, compensators for wires and roddings, Unit wrie detectors, Double wire rotary detectors. Semaphore Signal sepctacles, A type, B type and UQ. Table models of STD-III, LQ, 3 road station, Double line MACLS, Single line MACLS, 3 road station for placement of signals. Facing Point Locks, Hepper's key transmitters and E-type locks. Semaphore signal lamps, lamp trays for UQ, LQ. Models of ground lever frames, direct type SA530 lever frames and locking materials. Mechanical Lever Frames : Double wire (48 lever), Direct Type Lever (12 levers), Catch Handle Type Lever Frames. Std -III 3 line BG layout –Double wire operated MAUQ signalling , Distant signal motor operated, points are operated by wire mechanisms/rodding/SLM. 2-line MG layout with STD-I interlocking, LQ with mechanical disengager operated by direct LF SA530, points locally operated, points secured by HP locks. A swing type LC gate is located between outer and home on one side. Diamond crossing with 12 LF direct lever frame with shunt signals and detection by unit wise detector. 2-line BG layout LQ for demonstrating the inter-cabin slotting circuit with two end-cabins 16 lever frame with goomty for slide frame. Lifting Barrier Type LC gates. Misc : Electrical key transmitter (RE/Non RE), IRS type reversers and Lever locks, circuit controllers, Arm light repeaters.